Some patients will go through periods where they do not experience any symptoms and periods when symptoms flare up without warning. 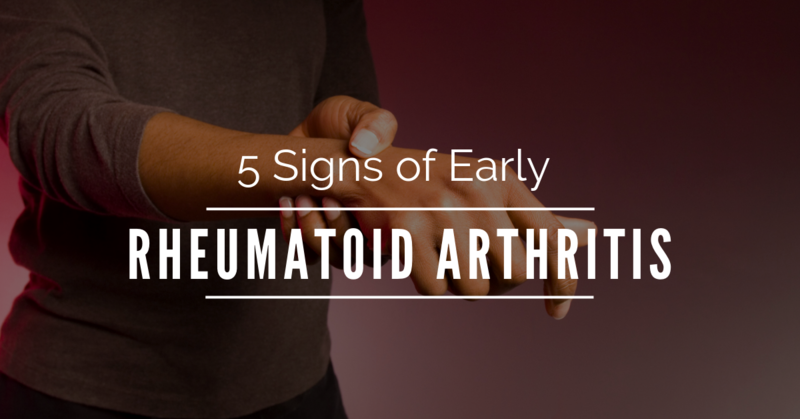 Early diagnosis of RA is significant in preventing later complications. The following warning signs may warrant a trip to your doctor's office. One of the first symptoms patients experience is extreme exhaustion. A patient's lack of energy can become particularly noticeable once it begins to affect their everyday activities, relationships, sexual drive, and work productivity. People with RA tend to have a slightly raised temperature, which often comes prior to any pain or swelling within the joints. Unexplained weight loss often occurs in patients with RA, as the sickly feeling that comes with fever and fatigue may cause them to start losing their appetites. Pain and tenderness within the hands, fingers, wrists, and feet are characteristic signs of RA. The joints at the middle and base of the fingers and base of the toes may become tender when pressed on or moved. The onset of stiffness within the joints often comes slowly and lasts for numerous days. This often occurs in one or two joints (usually within the fingers), and sometimes a general feeling of stiffness may affect the entire body. If you or someone you know is experiencing any or all of these symptoms, it's important to visit your medical provider. Early diagnosis and treatment of RA can reduce future complications from the disease. MCO's joint and pain management specialists can help you find ways to relieve your chronic pain from RA. We also offer a chronic pain support group that meets on the second Thursday of every month at 5:45 p.m. in MCO's physical therapy conference room.